To puree the blackberries, I just use a potato masher and mash away until the fruit looks more like pulp than berries. In a heavy saucepan, cook the milk, over medium-high heat, until small bubbles form around the edge and you see steam rising from the pan. Over medium heat, cook the custard, stirring constantly, until thickened and coats the back of a metal spoon. (If you’re using a thermometer, it will read about 170 at this point.) Remove immediately from the heat. Remove from heat, transfer to a large bowl and allow to cool for about 10 minutes. Whisk in the half-and-half, cream and vanilla. 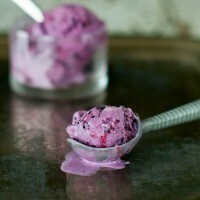 After the custard begins to thicken, add the pureed blackberries and continue churning until the ice cream is done.